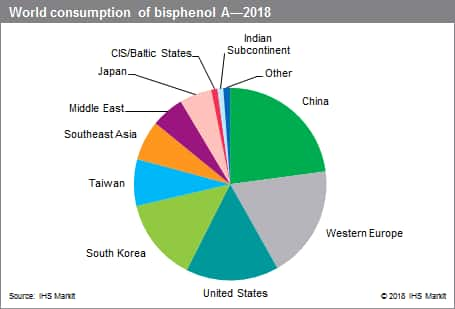 The overall health of the world economy will continue to play a major role in future demand for bisphenol A, as its derivatives’ major end-use markets include automotive, construction, and electrical/electronic applications. With more than half of the global demand, the Asian market will continue to expand. China’s market drives growth in demand and capacity in this region. The global bisphenol A (BPA) industry is led by demand for polycarbonate resins, which accounted for nearly 64% of BPA demand in 2018. Polycarbonate demand is mostly driven by the electronics, construction, and automotive industries. While polycarbonate and epoxy resins are the major applications for bisphenol A, other uses include flame retardants, unsaturated polyester resins, polysulfone resins, polyetherimide resins, and polyarylate resins. During the forecast period, brand owners will focus on the developing markets where there is demand from large groups of emerging middle-class consumers, including China, India, Southeast Asia, and Brazil. In the electronics/electrical application, energy, solar, lighting, and security are some of the subsegments that will present opportunities for polycarbonate producers to offer the potential of innovative design and cost savings. Devices that will help overcome poor infrastructure in the developing world, such as mobile phones, will see the most dramatic growth. Northeast Asia is the biggest player in the BPA industry, accounting for half of global BPA consumption and more than half of global capacity as of 2018. China is the major force in Northeast Asia driving BPA demand, as it accounts for almost 50% of regional BPA consumption in 2018. China is also projected to be one of the fastest-growing regions over the next five years through 2023. On a smaller scale, the Indian Subcontinent is forecast to see the largest increase in BPA demand, with an average annual growth rate of almost 30% during the same period; this is mostly due to the hypothetical polycarbonate capacity starting up in 2023. Western Europe and the United States are the other significant players in the BPA market; however, both are expected to see declining demand during the forecast period. polycarbonate baby bottles have also been pulled from store shelves in response to consumer concerns about BPA health effects. For many years, research has shown BPA to be safe at current exposure levels. However, research continues to be conducted, because of the concern over potential endocrine disruption effects caused by exposure to BPA. Over the last five years, total BPA consumption grew at an average annual rate of 2.5%. Global BPA consumption is projected to increase at an average annual rate of 3.6% per year through the forecast period to 2023.